Successfully Added VAG-COM v704.1 USB to OBDII Cable for Car Diagnostics to your Shopping Cart. VAG-COM v704.1 USB to OBDII cable for car diagnostics. This VAG-COM cable is an aftermarket tool to analyze ISO9141 and KWP2000 transmission protocols with 16pin OBDII style data link connector. OBDII CAN-USB V704.1 is compatible with the latest cars that require a direct CAN connection for diagnostics including all Golf-5 platform cars and latest Audi A3, A6, A8 and Q7. This amazing protocol timing works reliably even with complex control modules, such as the 1991-1994 1Z Audi TDIs and the 1993-1994 Audi 2.6L with Hella ECU. This model has built-In VAG saver functionality, which instantly alerts the user if the K/K1 line or the L/K2 line is shorted to ground. This faulty code product provides you with full support for dual-K lines found in new (B6/8E chassis Audi A4 and 2002+ Audi A6 and A8). No manual switches! Just plug in the USB to your laptop and the VAG-COM link to your vehicle. The USB OBDII interface VAG-COM cable is also fully compatible with older cars using a single K-line or K plus Line, and displays a bi-color (red/green) status/activity LED on the 16 pin cable cover. So, start self- troubleshooting today, and modify settings and clear errors in your vehicle using your laptop computer. This USB enabled VAG-COM cable will save you time and money in enabling you to diagnose your own car, and view results within minutes. NOTE: The CVFG-A09 works on vehicles that's are OBD2/VAG compliant. The best way check if your car is compliant with this type of cable is to check the car user manual, contact your car dealer or talk to your favorite mechanic. 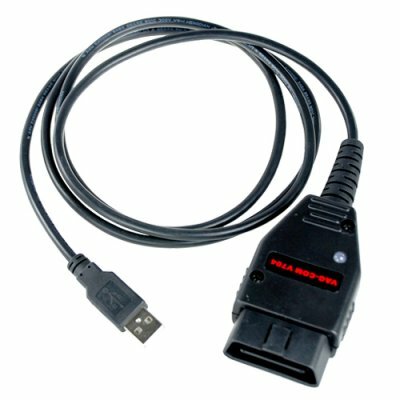 Can I use this CVFG-A09 car diagnostics USB To VAG-COM cable model on my Audi TDI? Yes it should work OK. The best way check if your car is compliant is to check the car user manual or contact your local car dealer. Just the ignition, but for some tests you might require the engine to be running. Can I use this cable with software such as _________ that my brother recommended? Maybe, but we have not tested it with any particular brand of software and can not guarantee performance or compatibility with any particular software package. I can change a lot of settings on my passat 2007 (automatically lock all doors when moving, on/off coming home, unlock only driver door when the button on remote is pressed once, horn when locking, and a lot more). absolutely recommend to any one. Very good cable, Good job! fast delivery (11 days), good product, now i can diagnose my car myself. so i can save lot of money. when chinavasion sells VCDS v9xx, i would like to buy it. on 2009-04-12 05:34:23 correct ,good ,fast ! aangetekend aangekregen met airmail , en snel !